Colors of the early evening sky are reflected in the windows of this flower shop on Federal Street. View other Skywatch Friday photos » here. The play on foreground/background in this photo is just marvelous. Love the basket/vases and the way the sky is on the one hand an afterthought and on the other the reason the vases are so warm and shadowy! This is a very tricky shot. Love the lighting and composition. 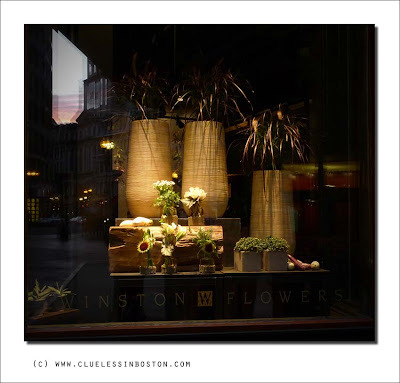 You have captured something gloriously delicate in your flower arrangement window, CB. The pastel sky and what could even be a moist footpath. I imagine I can see Gene Kelly whistling his way down the lamp posts. Oh, yes! Your lighting and composition are terrific! Marvelous shot! I love that window display! The sky's colors look very pretty too. Love this shot, perfect light and composition. A wonderful sky into the glasses! Fun photo for Sky Watch Friday, the florist really has a great eye for design. Enjoyed your photos of the old city hall as well, it is a magnificant building. I love the warm contrasts bettwen darkness and light. Great photo...one that really made me 'work' to catch all of its facets. And thank you for your comments about Mary Travers...sigh. Well done. You had a sharp eye to see all that. Lovely muted colors - a pleasure to look at; like a fine painting. cool idea, & I can see the sky!